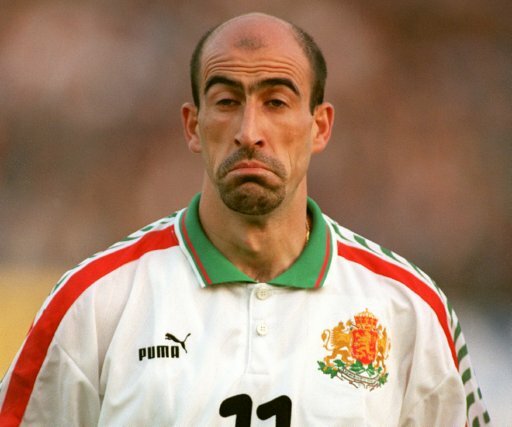 Yordan Letchkov, former Bulgaria international-turned-politician (and proud owner of one of the best sets of eyebrows in the business) has been sentenced to two years in prison after being found guilty of diddling his taxes while acting as mayor of his hometown of Sliven. Having ended his football career as player-coach at his hometown club, Letchkov – who is best remembered for his diving header winning goal against Germany in the quarter-finals of the 1994 World Cup – ran for office in 2003 and was elected as Mayor of Sliven on the ‘hometown hero’ ticket, going on to be re-elected for a second term four years later. In April of 2010 he was stripped of his Mayor-ship by the Sliven district court after being found guilty of official misconduct, though was reinstated in June after lodging a successful appeal. However, earlier this month Letchkov, now 45, went on trial accused of “mismanagement and abuse of power” during his two terms as mayor.The former Hamburg and Marseille midfielder was also charged with signing dodgy water deals and pressurising the local National Revenues Agency office into covering up specific local companies tax audits. Just weeks after thousands of Sliven citizens signed a petition to have him thrown out of office for good, Letchkov was found guilty and sentenced to two years in prison – though he does have a fortnight to appeal the verdict. Coming from Bulgaria its sad to say this type of thing is far too common. He as a real hero to me for the way he played in 94 but this is completly inexcusable. 2 years is the very least he deserves.